Like Cher, Dionne has a chic and fabulous style which makes all the boys and girls turn their head to. Like Cher's iconic yellow outfit, Dionne rocks hers with black and red tone. 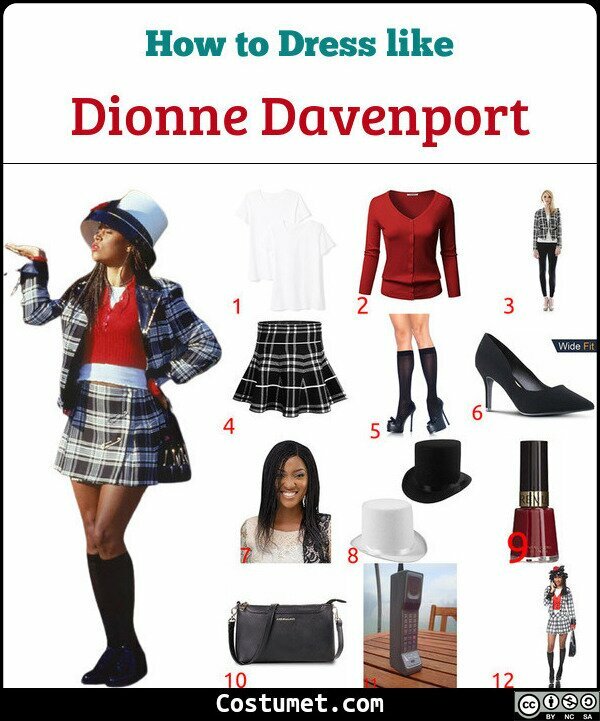 Dionne wears a white shirt topped with a red sweater and crop black plaid jacket, a tall hat, a plaid skirt, long black socks and black shoes. She also has an iconic braided hairstyle, red nails, and always carries with her a big 90s phone and a small handbag. If you want to recreate this level of fabulous, checkout our item list down below! 2 Red Sweater Top the T-shirt with a red sweater. 3 Black and White Plaid Jacket Top everything with black and white plaid jacket. 4 Black and White Plaid Skirt Pair up the top with a black and white plaid skirt. 5 Long Black Socks Look for a long pair of socks in black color. 7 Twist Braid Wig Recreate Dionne's hairstyle with a black twist braid wig with medium length. 9 Red Nail Polish Paint your nails with red to look as gorgeous as Dionne's. 10 Little Hand Bag Look for a little hand bag in black color to carry. 11 Big Phone Prop Hey! Hey! We can't go 90s without this giant phone. 12 Full Costume Have no time to gather all these items? Get this full costume! Dionne Davenport, played by Stacey Dash , is a best friend to the movie's protagonist Cher Horowitz, Alicia Silverstone , in the 1995 most iconic chick flick Clueless. Like Cher, Dionne is a rich, pretty, and cool girl in her high school's social scene. And thanks to her sense of fashion, Dionne is Cher's top critic when it comes to style and outfit. Despite being best friends themselves, Dionne's long-term boyfriend and Cher's ex step-brother (who later becomes her love interest) often to head to head in arguments. What you’ll need for this fun and easily made costume is a yellow plaid blazer and skirt set, a yellow cropped cardigan, knee socks, a white shirt, and black heels in a school girl style.